As a part of my ongoing effort to become indistinguishable from a senior citizen while still in my early 30s, I’ve been doing the New York Times Crossword lately. In order to protect myself from feeling like an idiot, I usually only attempt the Monday and Tuesday puzzles. Occasionally I’ll try the Wednesday. Often Sarah and I will work on the puzzle together at a restaurant, intimidating other patrons with our coolness. Anyway, it should come as no surprise that my very favorite puzzles are the ones with some sort of “high concept” built in. The best is when the answers not only follow a theme, but when something about that theme is echoed in the visual structure of the puzzle. The NYT recently ran my most favorite concept puzzle of all time. SPOILER ALERT: if you plan to do the March 15th NYT crossword – STOP READING NOW! So, yes: the theme is Beethoven’s “Ode to Joy.” Ok, ready to have your mind blown? 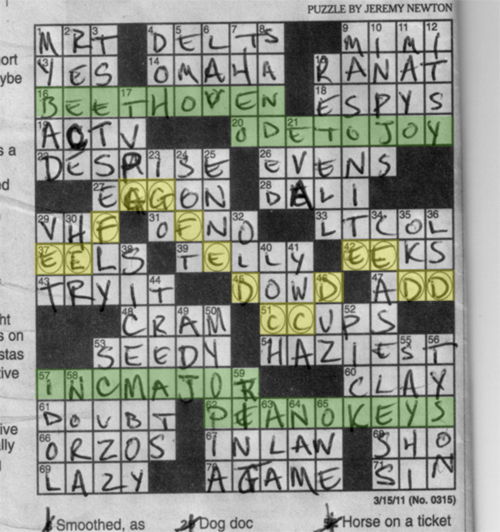 The circled letters, highlighted in yellow, denote the key musical phrase from “Ode to Joy,” with the letters moving up and down within the crossword grid corresponding to notes moving up and down the keyboard. Awesome, right? I know, I was pretty excited. If you’re into stuff like this (And really, who wouldn’t be?) the special features section of the DVD release of Crossword documentary Wordplay has a great collection of theme puzzles being described by their authors. Nerd alert!